As a geriatrician it is not uncommon to have patients present in clinic with signs of infection like cellulitis, an infection of the skin. 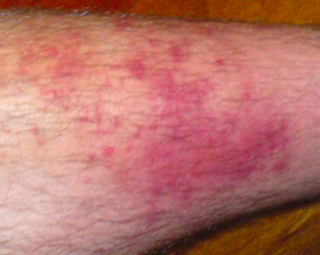 My patient, who I will call Mr. Sa, is a 79 year old man with a history of hypertension, high cholesterol, and COPD who struggled with recurrent cellulitis of his right lower leg. Despite two prior clinic visits and completed courses of antibiotics, the infection would heal but return several months later. In patients with recurrent lower extremity cellulitis, do prophylactic antibiotics, compared to no treatment, reduce the recurrence rate of lower extremity cellulitis? A search of the literature found a systemic review and meta-analysis of antibiotic prophylaxis for preventing recurrent cellulitis1. The systemic review used the Cochrane Collaboration tool for assessing the risk of bias and the meta-analysis was used to calculate a weighted treatment effect across trials. Five studies met the inclusion criteria resulting in a total of 535 participants with 260 participants taking antibiotics and 275 participants on placebo or not taking any antibiotics. The average age of participants in the five studies ranged from 45 to 67.5 years. A majority of the participants (397) were from the PATCH 1 and 2 studies located in the United Kingdom with a follow up time of 36 months. Statistical methods calculated included risk ratio, Chi2, and I2 tests. Analysis revealed that prophylactic antibiotics were beneficial for preventing recurrent cellulitis (RR 0.46, 95% CI 0.26-0.79) with a number needed to treat (NNT) of 5 patients. This means that 5 patients would need to receive the prophylactic antibiotics in order to benefit 1 patient (in preventing recurrent cellulitis). It should be noted that two of the studies (PATCH 1 and 2) were found to be high quality whereas three of the studies were of low or unclear quality with respect to randomization, allocation concealment, blinding, incomplete outcome data, and selective reporting. Overall limitations include a small number of studies performed in the United Kingdom, a heterogeneous study population among subjects, optimal duration of treatment was non-specified, and finally specific antibiotic medication choice (erythromycin or penicillin) varied across the studies. The most commonly reported adverse events with prescribing prophylactic antibiotics were nausea, abdominal pain, and diarrhea. These limitations hinder the generalizability of the study results, especially with varying antibiotic resistances profiles dependent on location. The review supports the positive impact of antibiotics for prophylaxis against recurrent cellulitis in the United Kingdom. However, there needs to be more randomized controlled trials set in the United States to determine the applicability, specific antibiotic choice, and optimal duration of treatment. For Mr. Sa, prophylactic antibiotics were not prescribed for cellulitis prevention given his allergy to Penicillin antibiotics. However, for future patients who struggle with recurrent cellulitis, the low NNT and low risk of side effects makes prescribing prophylactic antibiotic a treatment to consider. 1. Oh, C.C., Ko, H.C.H, et al. (2014). Antibiotic prophylaxis for preventing recurrent cellulitis: A systemic review and meta-analysis. Journal of Infection, 69, 26-34. Megan is currently a first year fellow in Geriatrics and Palliative Care at Mount Sinai Hospital in New York City. By reading this I hope this situation is easily curable. Now the over all world temperature is increasing and people are suffering with the problem like this.